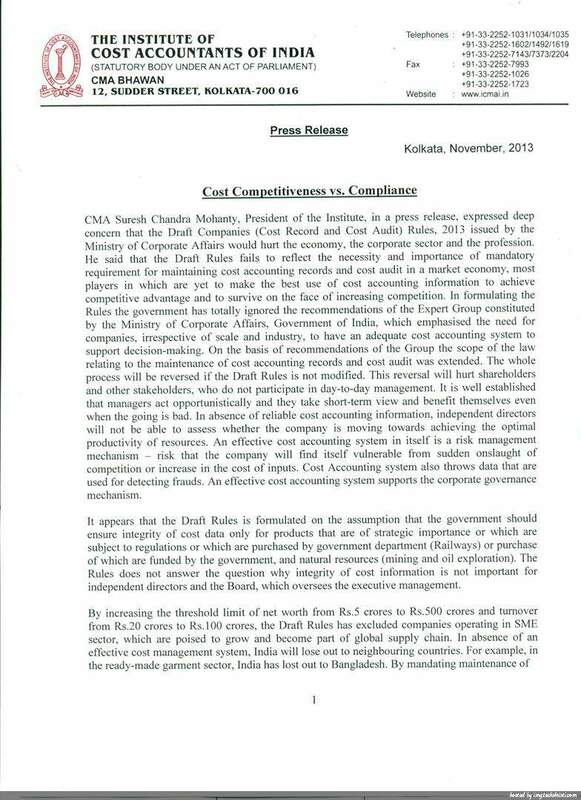 (1) These rules may be called the Companies (Cost Records and Cost Audit) Rules, 2013. (2) They shall come into force on the date of their publication in the Official Gazette. from the close of the company’s financial year to which the report relates. 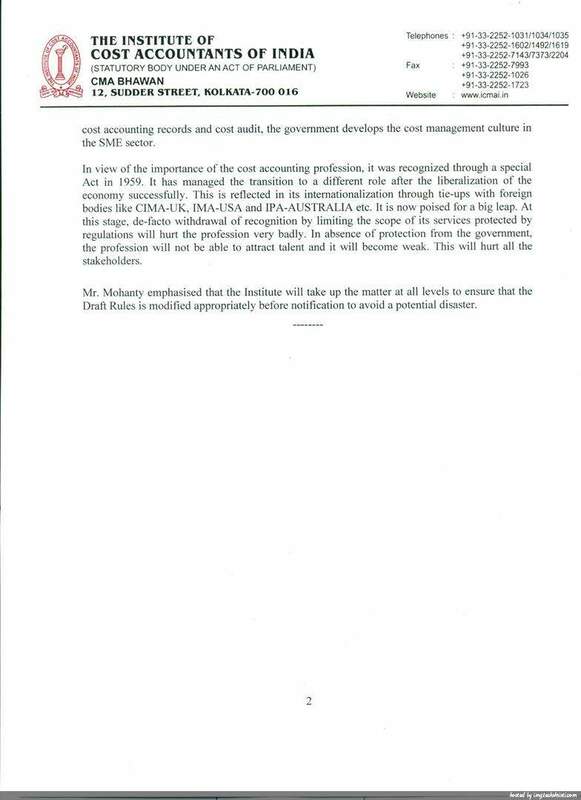 (a) Companies (Cost Accounting Records) Rules, 2011 (b) Companies (Cost Audit Report) Rules, 2011. Download Draft Rules (6th Phase) under Companies Act 2013 ·If you have already registered, login to the feedback form. ·If you have not registered, Click Sign up and use “User Registration” for getting login id and register password (No special characters allowed in Password). ·Login after signup process. ·Click Add Suggestion ·Click View by Chapter and Select “Chapter X- Audit and Auditors (139-148)” ·Click Select Rules “Companies (Cost Records and Cost Audit) Rules, 2013”. Select Section “ Section 148…….” ·Select Rule No. ·Select Suggestion Type o Drafting Suggestions ·Provide your feed back in the “Suggestions” box provided. ·Provide your feed back in the “Justifications” box provided. ·Click “Save” periodically and add suggestions. Finally “Save” and submit..... So, ICAI Fertinity do it now.. THE LAST DATE FOR GIVING SUGGESTIONS WAS 6th DECEMBER, 2013, WHICH HAS SUBSEQUENTLY BEEN EXTENDED TO 14TH DECEMBER, 2013. The procedure for registering in mca.gov.in for feedback on the Draft Rules. • If you have already registered, login to the feedback form. • If you have not registered, Click Sign up and use “User Registration” using your personal email id and register password (No special characters allowed in Password). • Login after signup process. • Click Select Rules “Companies (Cost Records and Cost Audit) Rules, 2013”. • Provide your feed back in the “Suggestions” box provided. • Provide your feed back in the “Justifications” box provided. • Click “Save” periodically and add suggestions. • Finally “Save” and submit. IT IS SUGGESTED THAT THE SUGGESTIONS AND JUSTIFICATION ARE DRAFTED IN A SEPARATE WORD FILE AND COPY/PASTE THE SAME IN THE FEEDBACK FORM ONCE THE SAME IS FINALISED.